MobiKin Eraser for iOS is one of the top eraser programs that provide you the functions to erase all deleted files, private data, system settings and other files on iOS device with no chance to be recovered. When you decide to give away your old iDevice, you need to erase all the data on it. Otherwise, your personal data like bank account and password, contacts information, chatting records or other information would be at the high risk of disclosure. Luckily, you have Eraser for iOS here to help you complete the erasure with one click. Everything is erasable: Files like contacts, messages, call logs, notes, reminder, calendars, Safari bookmarks, browsing data, music, videos, photos, apps, etc. can be erased by this software and never be recovered. Erase existing and deleted files: No matter the data is existed in your iDevice now or has been removed already, the tool can completely erase them with one simple click. Erase private data: Your private data like accounts, passwords, financial data, bank records and so on will be permanently deleted and no one will be able to restore them with any tool. Permanently remove all the files on your iOS device and be sure no one can restore the deleted files in any methods. So please backup the important data before the erasing process. No matter you’re going to re-sell, donate or send the old iPhone, iPad or iPod touch to anyone you like, you can use the program to clear and overwrite the contents by using the latest overwriting technology. In this way, none of your personal data will be disclosed. In different situations, users may have different erasing needs. And in order to meet these different needs, MobiKin Eraser for iOS is released with 3 different erasing level: Low Level, Medium Level and High Level. So you can select a security level according to your need and perform the erasure with an easy mind. Low Level: Erase the data on your iOS device with the quickest speed – twice faster than the other two ways, which can greatly save your time. Medium Level: Remove and overwrite all the existing and deleted data on your iDevice, leaving no possibility of data recovery. High Level: The most secure data destruction option- it will overwrite all the data on your iDevice two times to ensure the data is 100% unrecoverable. Apart from the highlights we have listed above, the best iOS eraser software also has lots of other attractive features that you may also interested in. Thanks to its advanced technology, the program will automatically detect the connected iDevice and conduct a deeply scanning on it. So that all data on the iPhone, iPad or iPod touch will be found and displayed in the program accordingly. 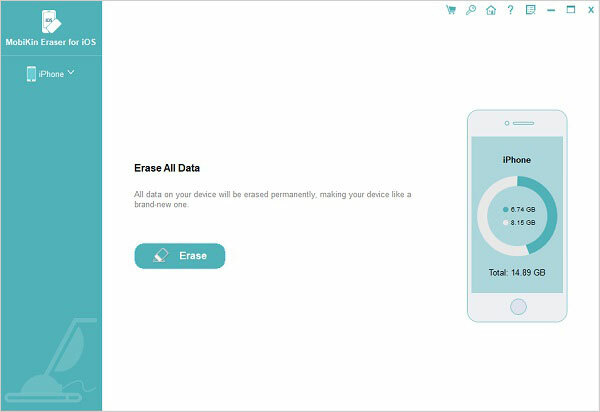 After the erasure, all the useless data on your device will be completely wiped to free up the space. Compatible with all generations of iDevices, including the latest iPhone X, iPhone 8, iPhone 8 Plus, iPhone 7, iPhone 7 Plus, iPhone 6S, iPhone 6 Plus, iPhone 6, iPhone 5S/5/4S/4, iPad Air, the new iPad, iPad mini, iPod touch, iPod classic, etc.